“Imagine a bill covered with microscopic holes that make it glow slightly in the light. It’s tech borrowed from a butterfly, and it may soon be foiling counterfeiters around the world. The technology was inspired by the Blue Morpho butterfly, whose brilliant blue coloration comes not from pigment but the way that tiny holes in its scales reflect light. But the tech, called Nano-Optic Technology for Enhanced Security (NOtES), is different from the Morpho butterfly’s wings, and pretty much all other bio-inspired reflective optical technologies, in that it is both extraordinarily thin and functions even in dim light. 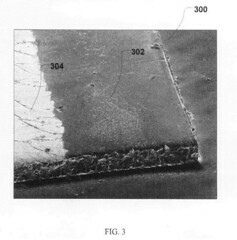 If you are interested in digging deeper into the technical details, have a read of “US patent 2010/0271174 – Security document with electroactive polymer power source and nano-optical display” by I|D|ME‘s Chief Scientific Officier Bozena Kaminska (a list of Bozena’s US Patent) and Chief Technology Officier Clinton K. Landrock (a list of Clint’s US Patent) (by the way, here is Clint’s Twitter). Here are two informative videos from NanoTech Security so you can see how cool it is. I am a tech geek so I love cool technologies but I am also realistic as I understand there are many real world requirements and challenges before this or any other advanced technologies are accepted and adopted. By the way, Bank of Canada is in the process of launching the 2011 series of polymer banknotes with technologies by Securency International and BoC and printed in Canada by Note Printing Australia (NPA is a wholly owned subsidiary of the Reserve Bank of Australia). 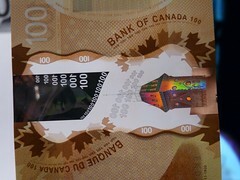 So far, BoC has launched the new polymer $100 banknotes in Nov 2011, and will launch the $50 in March 2012, the widely circulated $20 in Fall 2012. And $10 and $5 before the end of 2013. 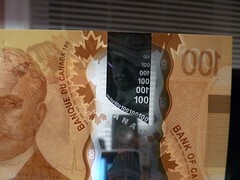 To deter counterfeiting of banknotes, BoC plans to update its banknotes design faster than before (in 8 years time). * NanoTech Security (NTS) is a TSX-Venture listed company and you can download its financial & regulatory filings from the Canadian Securities Administrators SEDAR database by searching for “NanoTech Security Corp“. 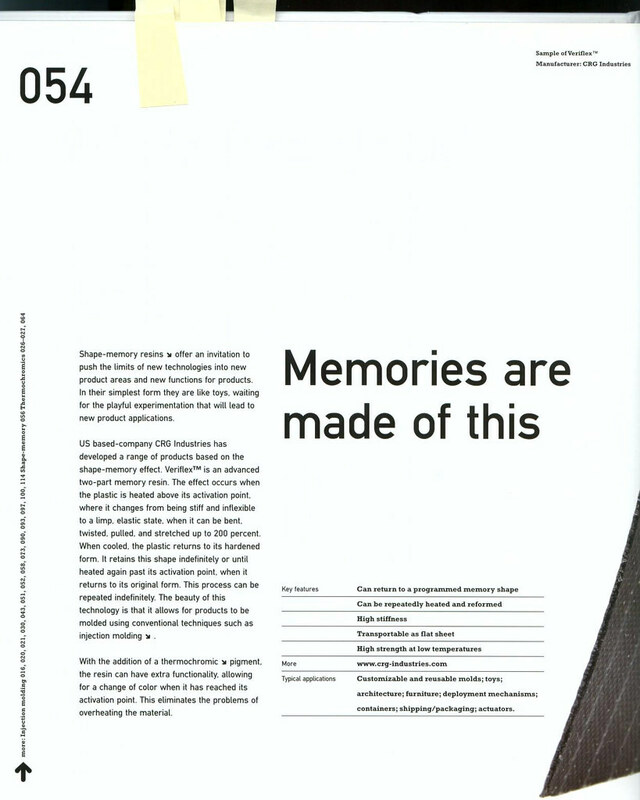 For some reason, I could only find annual reports from 2003 – 2008. I am surprised I couldn’t find annual reports for 2009 and 2010 in the SEDAR database. What happened to these two reports? P.S. For the record, here is some not so positive news about Securency International (July 1st, 2011 press release) and Reserve Bank of Australia & NPA (July 1st, 2011 press release). I’ve written and speculated extensively about the new Canadian polymer notes. Finally, I am excited to say I’ve got one in my hand now. 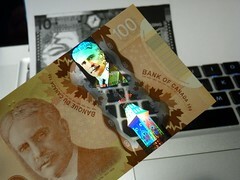 Have a watch of this slideshow of the new polymer C$100. 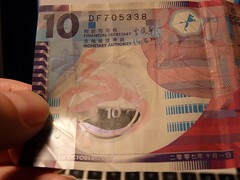 In comparison, watch this slideshow of the HK$10 (which is less than US/C $2). Here is a video of me checking out the new polymer $100, I slowed down the video at various place so you can have a closer look at some features. 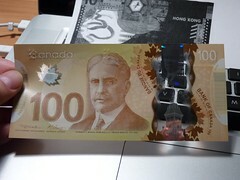 1) Raised ink: I definitely feel the raised ink on the large “100” and the shoulders and different parts of the bill. 2) What hidden 100? 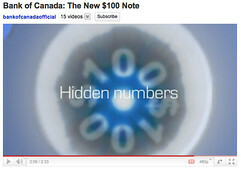 I have given up trying to find the hidden numbers (using a single light source) in the maple leaf! Some people can see it, not me. So if this security feature is hard to use, or only some people (or small percent of people) can use it, I am questioning if this is a good security feature at all! Note: I wonder if this feature is the WinDOE® (Diffractive Optical Element) as I wrote in “12 possible security features” in March? 3) Polymer but not cheap plastic feel: I actually quite like the feel and don’t feel it is “cheap” or anything thing. It feel like it is good quality. But only time and actually use will tell. 4) Large transparent window and metallic strip: I LOVE them! To me, they are the best part of the bill. They are extremely easy to inspect and tell if it is a real $100 with minimum training! 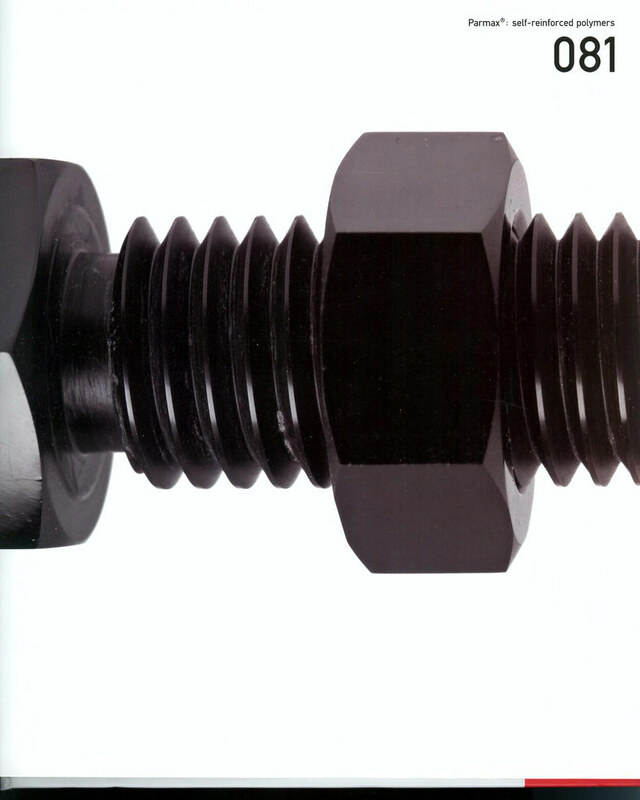 They are hard to fake thanks to Securency International’s security features and patented technologies. 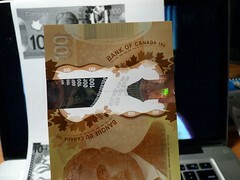 Nov 17th update: Happy to say I finally got a chance to play with my new Canada polymer C$100 bill (with video). 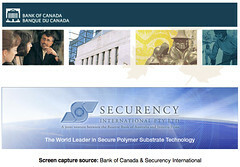 March 13, 2011 Update: I’ve got confirmation from BoC on Friday afternoon the Guardian® (supplied by Securency International) is indeed the polymer substrate to be used in the new plastic banknotes. By the way, for some reason Securency International‘s website seems to be down for the last few days. It should be noted that I know banks don’t usually like to talk about their security systems in detail. Many banks still believe (falsely) that the less we know, the more secure their systems are. Not true! I believe that good security has to be based on solid science and careful implementations. And “security by obscurity” is never enough nor secure. 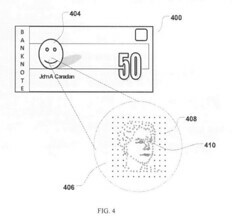 You can do the USPTO Patent search yourself for Securency to read more. Or you can use the Google patents search for Securency where you can download patents and patent applications with text and diagrams in PDF files (pretty handy). 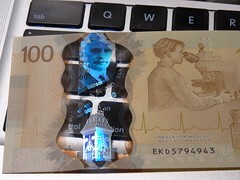 The Bank of Canada today (March 11, 2011) announced that it will begin circulating new polymer (plastic) banknotes starting with $100 in Nov 2011 ($50 in Mar 2012, $20, $10, and $5 notes to be issued by end of 2013). 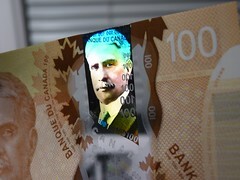 Publicly, BoC has NOT disclosed what security features will be deployed in these polymer banknotes. But basing on research using publicly available information, I will try to give you an advance look of 12 **possible** security features in the new Canadian polymer money. From Guardian®, I then found that it is made by Securency International. And if I had known what to look, I would have found BoC actually stated this in its backgrounder: the polymer substrate will be supplied by Securency International. I want to be clear that the following are 12 security features of Securency International‘s Guardian substrate. Since I don’t think Securency make any other polymer substrate, therefore logically BoC must be using Guardian so these 12 security features are all possible/available to BoC. Here are the 12 possible security features with emphasis added. Since I don’t have the costs associated with these features and I don’t have any inside knowledge whatsoever, I am only taking some wild guesses and base my comments on what I see in the HK$10 note (about less than C$2). Well, it is time for another entry from the wonderful Plastic 2 (after my previous entries on plastic). Here are some info on plastic with memory. Well, it is time for another entry from the wonderful Plastic 2 (after my previous entry). 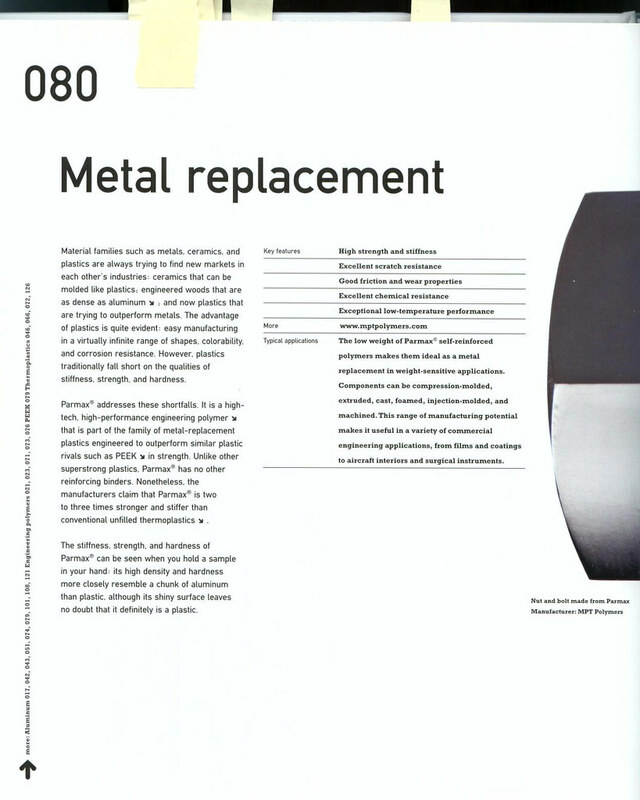 Here is some neat metal replacement plastic. 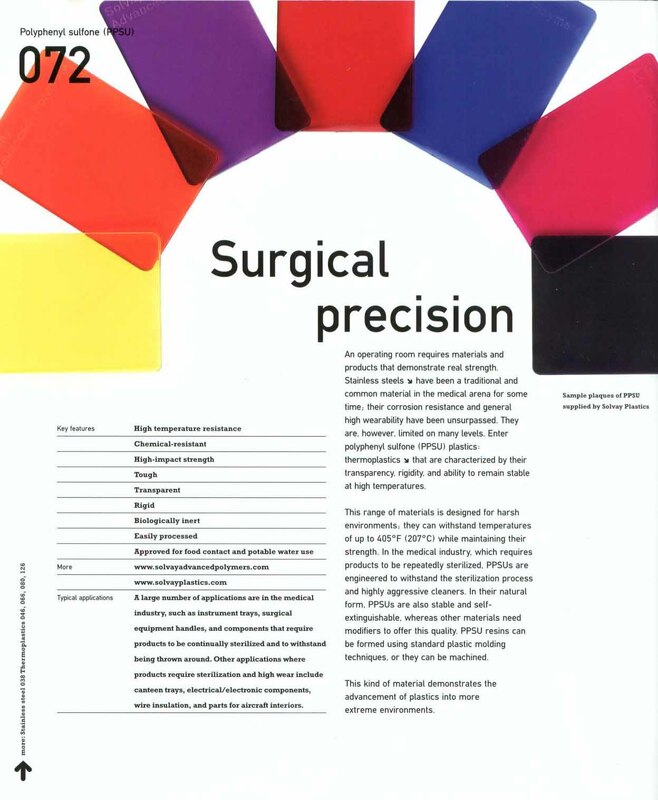 RADEL R polyphenylsulfone is a really cool surgical precision plastic from Solvay Advanced Polymers. You are currently browsing the archives for the plastic category.